Wrexham's former police station will be demolished after it was found that it lacked sophistication and elegance. 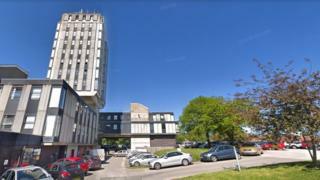 The 10-storey concrete tower, built in the 1970s, was being considered for protection by heritage authority Cadw. North Wales Police has opened a new divisional headquarters in Llay and a new station for Wrexham is being built. Police commissioner Arfon Jones welcomed the announcement and praised Cadw for its "common sense deliberations and decision". Supermarket chain Aldi has agreed to buy the site but the deal is conditional on planning permission being granted to build a new store there. The station closed in January after more than 40 years as a divisional base for the force. "We acknowledge that the building is a rare and unusual (possibly unique) example of slab and podium design in Wales which makes an expressive architectural statement," Gwilym Hughes, deputy director of Cadw, said in a letter to Mr Jones and Chief Constable Carl Foulkes. But Mr Hughes said the building had to be compared to others associated with international modernism. "I can confirm the in the handling of form, materials and design, the building does not compare favourably with other buildings of similar design which are notably more sophisticated and elegant," he said. Mr Jones added: "We were pleased to hear the threat of this potential spanner in the works has been lifted."